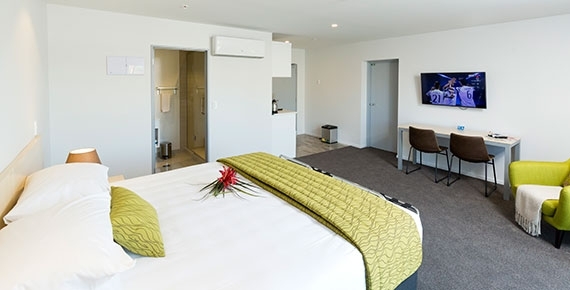 The 239 On Lincoln Motel was architecturally designed by Keith Asher, one of Christchurch's top architects. Book now as we are here to help with all your requests to make your holiday enjoyable in every way. 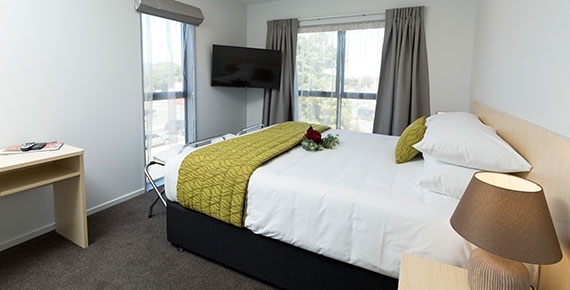 This motel is one of Christchurch's first to be able to cater for any bedding requirement. 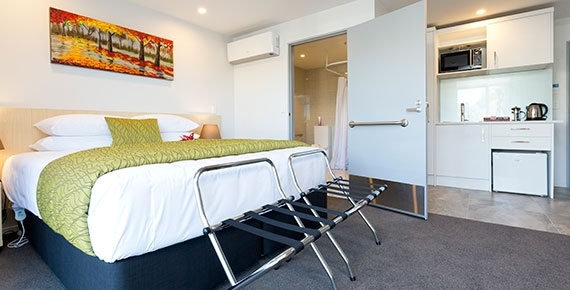 Most rooms have an adjoining room with a soundproof door that can be unlocked if required, as well as luxury spinal beds of the highest standard that can be split into twin beds or left as super-king beds. 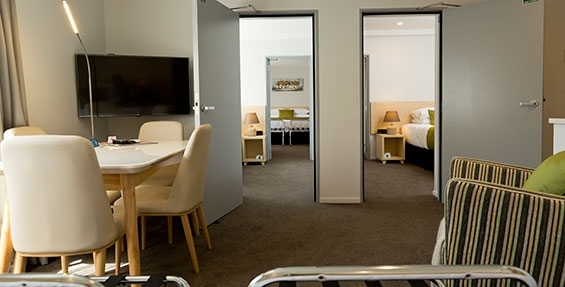 The large luxury access studio suite has a combined bedroom/lounge with a heat pump, is double-glazed and has kitchenette facilities with a microwave oven. The fully tiled large bathroom includes handrails and a flat floor for your ease. 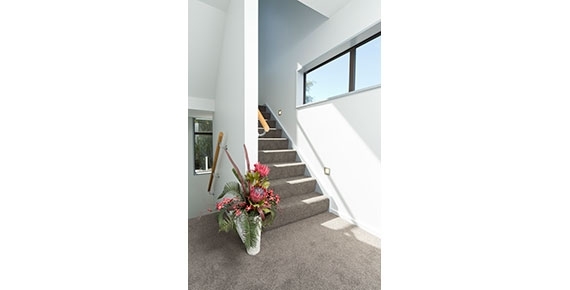 If you need to bring a support person or a family member, there is an adjoining luxurious access studio with a soundproof interconnecting door. Large double sliding doors open to an outdoor area. 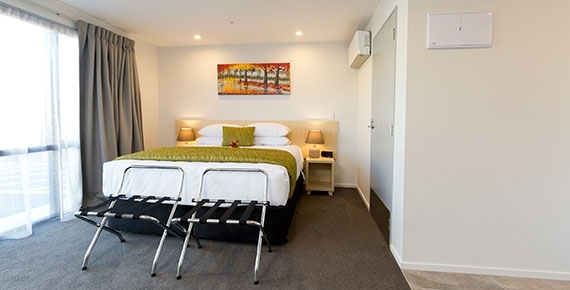 With parking right outside your door, cooking facilities, and a heat pump, this suite has everything you will need to make your stay a home away from home. 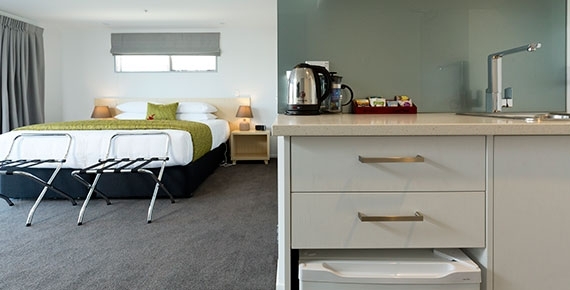 The large luxury studio suite gives you the choice of a super-king or two single beds. It has a combined bedroom/lounge with a heat pump, is double-glazed and has kitchenette facilities with a microwave oven. 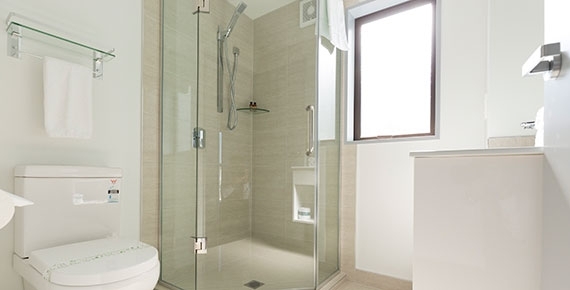 The bathroom includes a fully tiled larger than normal shower, a vanity, toilet and heating. Also available in some of our studios are soundproof interconnecting doors to another large luxury studio, in case you are accompanied by extended family or friends. 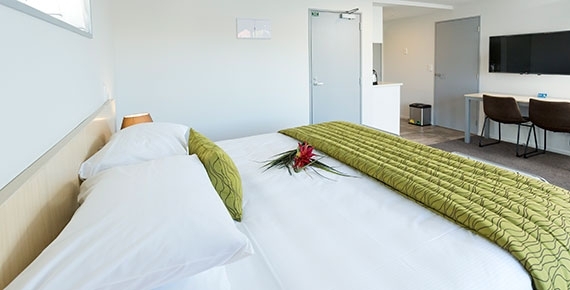 The luxury 2-bedroom suite gives you the choice of a super-king or two single beds in the open-plan combined bedroom/lounge and a queen-size bed in the second bedroom. 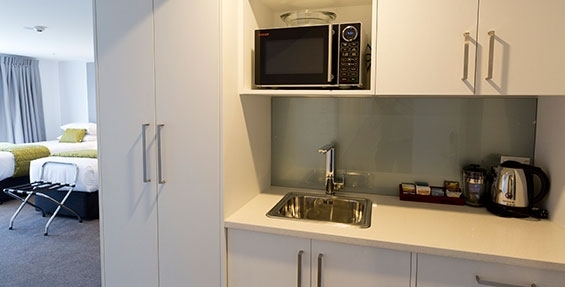 There is a heat pump, is double-glazed and has kitchenette facilities with a microwave oven. 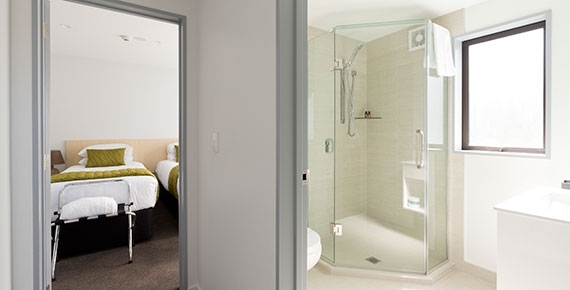 The bathroom includes a fully tiled larger than normal shower, a vanity, toilet and heating. 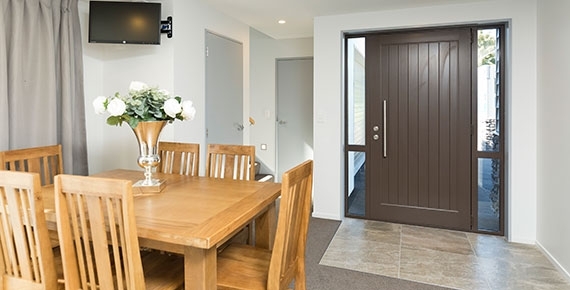 Also available in some of our studios is a soundproof interconnecting door to another luxurious studio, in case you are accompanied by extended family or friends. 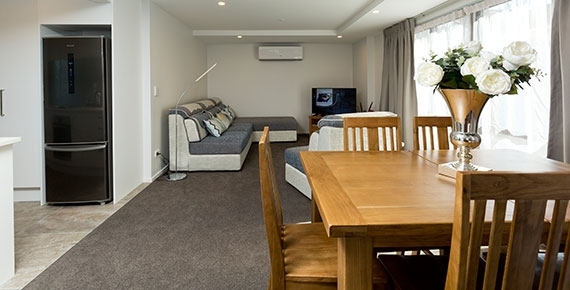 With parking right outside your door, cooking facilities, and a heat pump, this suite has everything you will need to make your stay a home away from home. 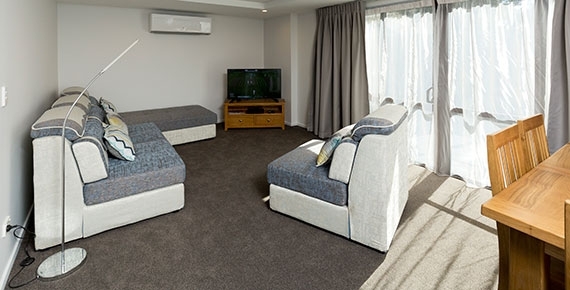 The luxury 3-bedroom suite gives you the choice of a super-king or two single beds in the open-plan combined bedroom/lounge and 2 x single separate bedrooms. 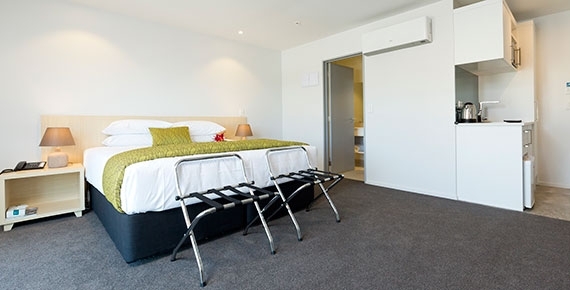 There is a heat pump, is double-glazed and has kitchenette facilities with a microwave oven. 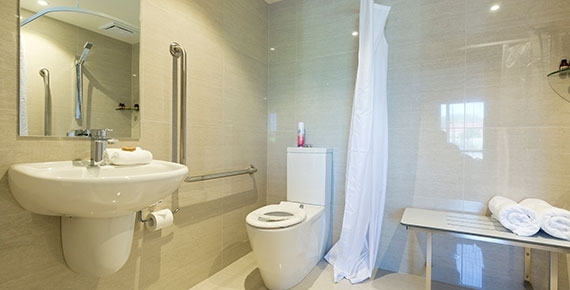 The bathroom includes a fully tiled larger than normal shower, a vanity, toilet and heating. 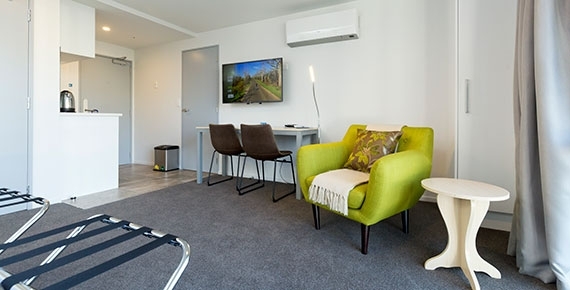 Also available in some of our studios is a soundproof interconnecting door to another luxurious studio, in case you are accompanied by extended family or friends. 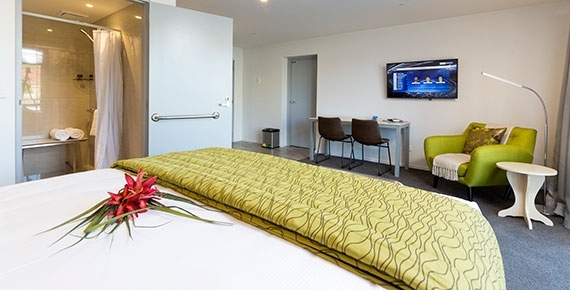 With parking right outside your door, cooking facilities, and a heat pump, this suite has everything you will need to make your stay a home away from home. The luxury 3-bedroom apartment is a townhouse with 3 levels that is furnished to the highest level for you and your whole family's relaxation. 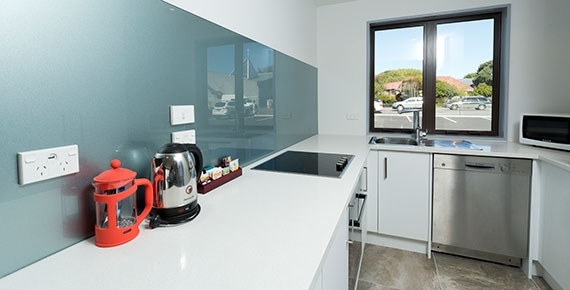 The first level has a full kitchen with the up-to-date appliances, fridge-freezer, full oven and dishwasher. Open-plan living with large sliding door opens out to a large patio area that is great for entertaining. Off the kitchen/dining area is a downstairs toilet and wash basin. 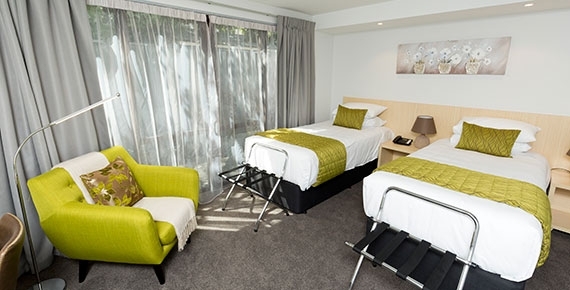 The second level has 2 bedrooms with king, super-king or twin beds, own bathroom and toilet and a TV in each bedroom. 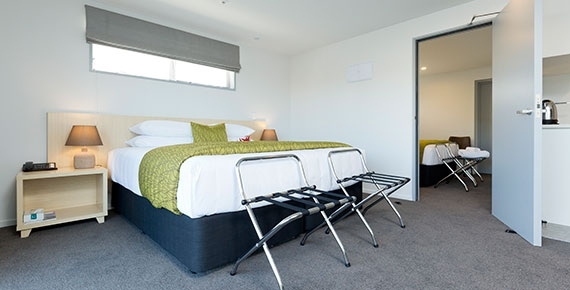 The third level is the master bedroom with a king-size bed, ensuite bathroom, TV and a great view over the Port Hills. 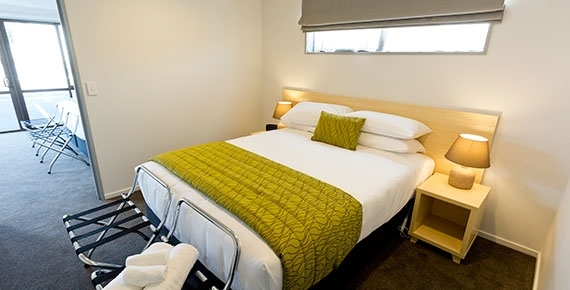 This apartment can also be set up for a small conference, with outside caterers to supply food. This spacious large apartment is truly a home away from home and more. Should you need to cancel/change your reservation, 72 hours before arrival no charge applies. 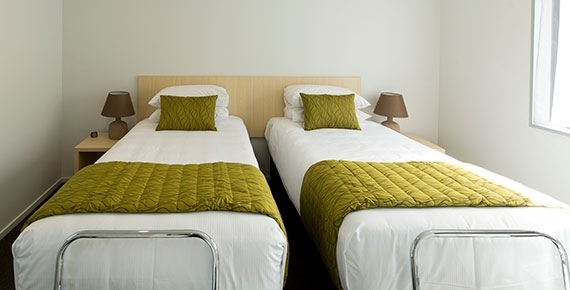 If you cancel any room you booked within the 72 hours of arrival nights, the 50% of accommodation will apply. In the case of a no show the full accommodation will be charged. Check in time is from 2:00 pm to 8:00 pm on the day of arrival, and check out is by 10:00 am on the day of departure. If you require the room outside these times then please contact us and we will do our best to accommodate your request.